So it's rather obvious that Chandra Ablaze is considered the least powerful Planeswalker printed so far. Numbers don't lie and she is literally listed at 2 bucks (as of the time of this writing). You have to realize how insane that is since the Core Set Planeswalkers have literally been reprinted multiple times, most are in Duel Decks, and have promotional printings and they aren't even that cheap. So first we're going to go over the card itself and then some deck ideas. You might wonder, "Why is she so terrible?" I'm here to go over the basics. 1) Mana cost - Most Planeswalkers that actually are worth anything are around four mana. Chandra Ablaze is at six. This not only hurts her in the fact that she arrives unfashionably late but she's also in the wrong color for such a high mana cost. Red sadly has a major gaping flaw in the game of Magic and that's the fact that the color runs out of steam rather quickly. I'm glad that the design team is trying to give Red a weapon for late in the game but the phrase, "too little, too late" rather fits here. Much like most of Red's heavy hitters, they don't do enough by the time they finally hit the board. This already makes the card rather unsightly. 2) First ability - This generates card DISadvantage. That alone makes this ability utter crap. To make it even worse, you have to specifically discard a Red card which narrows down some interesting options to pitch. Remember kids: Lands are colorless so you can't pitch those. Since Red runs out of steam so easily and is the worst color at drawing cards, that makes it very difficult to feed Chandra Ablaze cards to pitch. That makes it even harder to build loyalty counters for her final ability. 3) Second ability - This is literally her best ability and it isn't a good idea to use it the second you drop her on the field but it's what you're going to want to do almost every time. By the time you can play a six mana card (which isn't usually turn six mind you) you're going to be running on top deck mode. Top decking is when you literally have no cards in hand and each turn you're hoping the top card you draw from your deck is worth something. If you dare use this ability first, she's going to be at three loyalty which puts her dangerously low. The only problem is that this ability is a double edged sword. You might be able to go from zero to three cards but your opponent gets cards too. It's rather unlikely that they had more than three cards by the time you cast this so it isn't that effective at getting rid of a full hand either. 4) Third ability - Her ultimate is useless if you're packing too many creatures but most likely this is literally a "win more" situation. Most people don't understand the "win more" concept so let me explain. If you are already playing a Red deck with tons of spells (typically burn) to abuse this ultimate with then by the time you've managed to get Chandra seven loyalty counters, you've probably already won. 5) Protection - The best Planeswalkers have ways to protect themselves. Typically that means making tokens to block for them or stop creatures in some way. 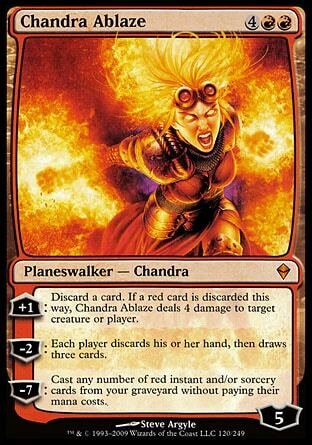 Sadly, the only thing Chandra Ablaze has going for her is her first ability to stop creatures and it isn't very efficient since you'll probably just be discarding a creature that could have blocked or another burn spell that would have done about the same thing. Now that we're on the same page here and you understand her flaws, you also have to realize that these flaws do NOT make her unplayable. She is very useful but only in VERY niche decks that can turn those flaws around. Since this is a special edition of Decklist Ex Machina, I've got multiple decks for you this time. All three of these decks are Red/Black with drastically different strategies. I'm going to do the opposite of the previous weeks and show the decklist first and then explain the choices. FIRST DECK: Slag it to Them! A friend of a friend recently opened up a pack and pulled a Dread Slag. It made him rather sad faced so this list is meant to cheer him up. This goes out to all of you Dread Slag owners out there! Dread Slag is a rather clumsy critter. If you dare have two cards in hand then he's rather worthless. Having three cards means he's kicked the bucket. The good news is: We don't plan on having any and we're going to like it. Hellbent is a keyword on some of those cards above that get bonuses when you have no cards in hand. To do this, you'll need ways to get rid of those cards. Chandra Ablaze, Jaya Ballard, Gathan Raiders, and Gibbering Descent all have ways of letting you discard cards. Rather than discard cards for the hell of it, we're going to discard cards with Madness (and a couple reusable cards). Fiery Temper, Reckless Wurm, and Gibbering Descent all have Madness. What this means is, it still counts as the card you had to discard but you get to play them at a cheaper cost. Squee and Punishing Fire can also be discarded multiple times (reduce, reuse, and recycle folks) and the beauty of their card text is the fact you "may" return them. You never have to if it's a bad situation to do so. Most likely though, you'll be returning Squee almost every turn to discard him over and over to get the full use out of them. Chandra Ablaze's first and second abilities are easily abused in this deck and that's what we're aiming for. Discarding cards is now a GOOD thing. THIS IS MADNESS! No.... THIS IS DREAD SLAG! Most of these card choices are rather obvious after you look at the cards themselves. They all work wonderfully together and the deck abuses Hellbent and Madness rather maniacally. If your group allows slightly older cards then Violent Eruption is another card to take a look into. Gathan Raiders is probably the only card I need to explain. You can play it as a morph creature (3 mana for a colorless 2/2 face down) and then use it's morph cost to flip it up (discard a card) to be a 3/3. If you have no cards in hand then it gets +2/+2 so in this deck it's typically 3 mana for a 5/5. Reckless Wurm and Dread Slag are rather similar in that they are huge for what little you have to pay to get them on the field. I think we can all agree that it's rather awesome to play a consistent Dread Slag and this deck offers that chance (as well as full use of Chandra Ablaze). It might be interesting to change one of the cards for Fling since then you'd be able to Slag it to them literally (two mana to deal nine damage? yes please). Warning: Do not use Chandra Ablaze's second ability if Dread Slag is on the field. It will die due to state based effects. This isn't a flaw in the deck since most people are going to want to kill your giant 9/9 trample creature in the first place. If they don't then they're as good as dead anyways. Key players are Kederekt Parasite and Underworld Dreams. Spiteful Visions (which is a Red permanent) and Howling Mine force everyone to draw extra cards which draws you into more things to abuse while draining them of life. 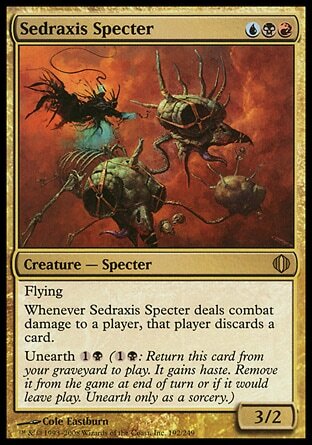 Burning Inquiry and Chandra Ablaze can help you discard Sedraxis Specter so that he's Blightning's 5-8. You might give them the cards temporarily but no one said you had to let them keep them. Chandra Ablaze also counts as a Red permanent for the Parasite and her second ability is rather gross in a deck like this. Thanks to the Specter and all of the card draw, her first ability is rather useful here as well. The goblin tokens are there to be Red permanents and chump block anything your opponent throws at you. If you can find room then Quest for the Nihil Stone is rather nice but otherwise forget it. I can't think of what to take out for it and right now it looks like a "win more" card in this decklist. Wheel of Fate is another card I was looking at buuuuut I'll just have to make mention of it here for now. It's much more preferable to have dual lands and fetch lands to really abuse this deck but I realize that many can't get a hold of them so I only put the cheapest lands in the list itself. As of now, the deck runs slower because of the mana base but it's still consistently able to play Underworld Dreams (which is the real problem child due to the three black mana requirement). Molten Slagheap is another budget option for lands. Dragonskull Summit and Graven Cairns are examples of expensive but effective dual lands for this kind of deck. This deck aims to unleash a quick swarm of creatures that can be reused with unearth if they fall in battle. 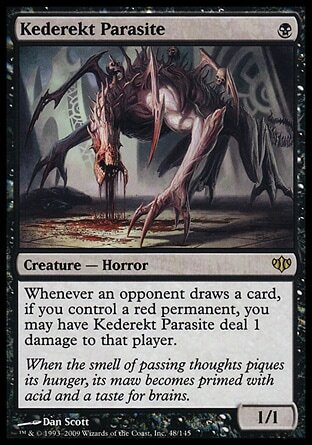 Certain cards like Sedraxis Specter and Extractor Demon are meant to be discarded by Chandra or Rotting Rats on purpose so that they can be used as insanely efficient burn spells. Crumbling Necropolis was added in in the rare chance you can cast a Sedraxis directly. Sign in Blood, Viscera Dragger, and Chandra's second ability refuel your hand for more burn and unearth style burn. This deck isn't afraid of spot removal or mass removal and the unearth creatures are more potent than most burn spells. I was tempted to throw in Seething Song just to boost speed and get out Chandra as early as possible or make insane plays with Hell's Thunder but I figured it might be best to just leave it out. Final Notes on all three decks: I made it my goal to make three Black/Red decks without having to use the staple Lightning Bolt and making sure to have Chandra be rather important for each list. I also wanted to make each list have vastly different strategies and play styles. Last but not least, I've managed to stay in a budget. I think I've accomplished all I can do here for now. These were all made literally in one day and haven't been playtested yet so they lack a bit of polish and fine tuning. If you get the chance before I do then please let me know what works and what doesn't.